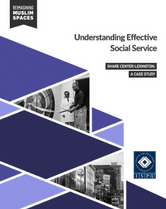 This third report in ISPU’s “Reimagining Muslim Spaces” series presents a case study of the SHARE Center in Lexington, Kentucky. The SHARE Center is a Muslim-run community social service center. It has been effectively providing economic assistance in a low-income neighborhood since 2011. The SHARE Center offers employment services primarily for former inmates. Other services include a food and clothing bank, a free medical clinic, food programs, and referral services to other community service providers. To illustrate how mosques can serve as hubs for hope, ISPU identified real life examples of American Muslim Institutions doing just that. Rather than simply providing theoretical advice, our researchers interviewed the very people who built these programs and institutions to identify the secret to their success and the wisdom gained from their struggles. We hope these case studies will inspire and instruct others working to develop institutions that serve and uplift. Insert your information to download the case study. ISPU uses this information to see which organizations and individuals are using our materials in an effort to better serve our audiences. We’ll also contact you (infrequently) with new research updates so you’re up to date on the latest from our research team.